This week has mainly been about knitting stripes. 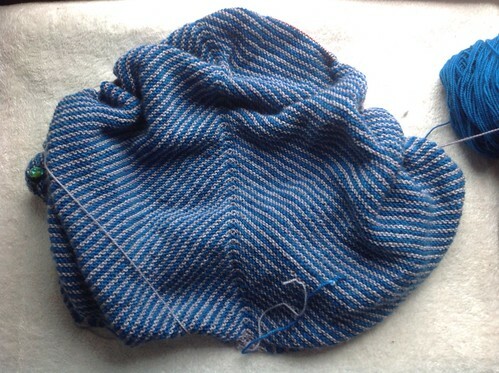 I am knitting a striped shawl in 4 ply, with a non-standard shape. It is designed to wrap around the shoulders. This shawl uses the yarns I shared with you a couple of weeks ago. I was right about how lovely this yarn is to knit with. It's so soft and creamy against my fingers. I have almost reached the end of the striped section of the shawl. I have reached the stage where I think I will start weighing the yarn to see how much is used for each stripe. I can then decide when to stop striping, so I don't run out of yarn 2/3rds of the way through a stripe. As you can imagine, each stripe takes quite some time to knit now! Once I have finished striping I can start knitting on the border in the dark colour. I have yet to choose a border pattern, and I think I really ought to start soon so I can fiddle around with stitch counts on the final row. After all the mindless stripes, I'm looking forward to doing the lace border. I have also been working on my spinning. 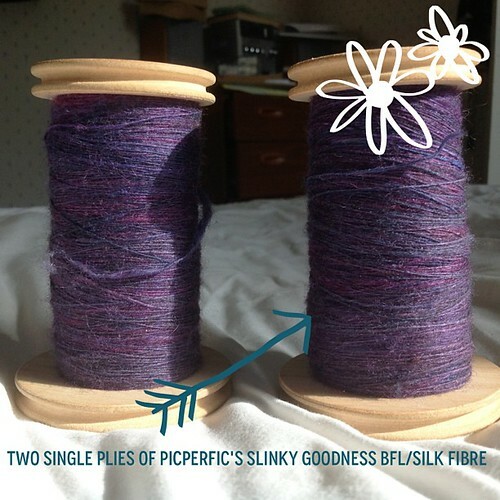 I have two single plies, created from the Slinky Goodness from Picperfic. I think I will have quite a fine yarn when it is plied together, and I'm also fairly sure it will be a gorgeous yarn too! These plies are currently "resting" before being plied together. Apparently, the plying is much easier with rested plies, because the twist is more settled and less likely to kink up and cause problems. I really want to get this into yarn form and see what my yardage is and what gauge it will knit at. 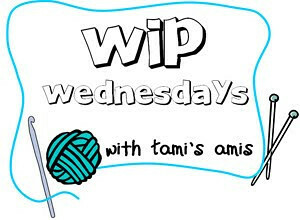 I am itching to knit with it! I have also been planning my next project. After the big garter stitch shawl I am keen to do a quick and interesting project. I have decided to use one of the patterns I won, Drizzle by Mel of Single Handed Knits. I have the perfect yarn in my stash. 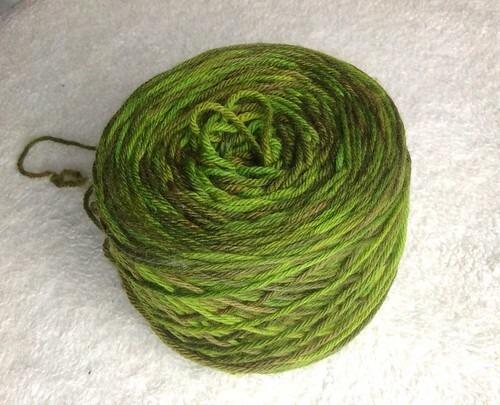 This is a sport weight yarn from Posh Yarns, Martha Sport, in a Tree Called Life colourway. Its a merino, cashmere and nylon blend and has sumptuous shades of green through it. I think the pattern will really show off this yarn and it will be a pleasure to knit with. I'm desperate to cast on this project, but I've been held up by the steep learning curve that Knit Companion has. This is actually quite a good project to learn setting up on Knit Companion, because it is relatively straight forward, but it does have a small chart and sizing. I finished setting up the pattern last night and I think I might be able to cast on today. Knit Companion is not an easy app to get to grips with, but it is a very powerful tool and there are very comprehensive tutorials and webinars are available too. The app was free to download and there are several free patterns that have been set up already for you to use. You can then follow the tutorials and see if you like using the app before buying the full version for £10.99. It is not a cheap app to buy, but I think it is worth every penny for such a complex piece of software that will enable the user to knit a project easily, in a way that keeps perfect track of where you are, and what comes next. Once I have done the hat pattern, I will return to the Dew Drops Shawl and set that more complex pattern up on Knit Companion and carry on knitting that shawl. The new app has stalled this project, significantly. I really want to get on with it now but I think once I've learnt how to set up that pattern, I'll feel pretty confident about setting up in the future. To see what other folk are getting up to, click on the button.